Good-ness! I have missed you all dearly. this poor blog and my lovely blog friends have been neglected. so now I can pay some attention to that which I love that's been pushed aside. which is really an old CAL with a little twist. 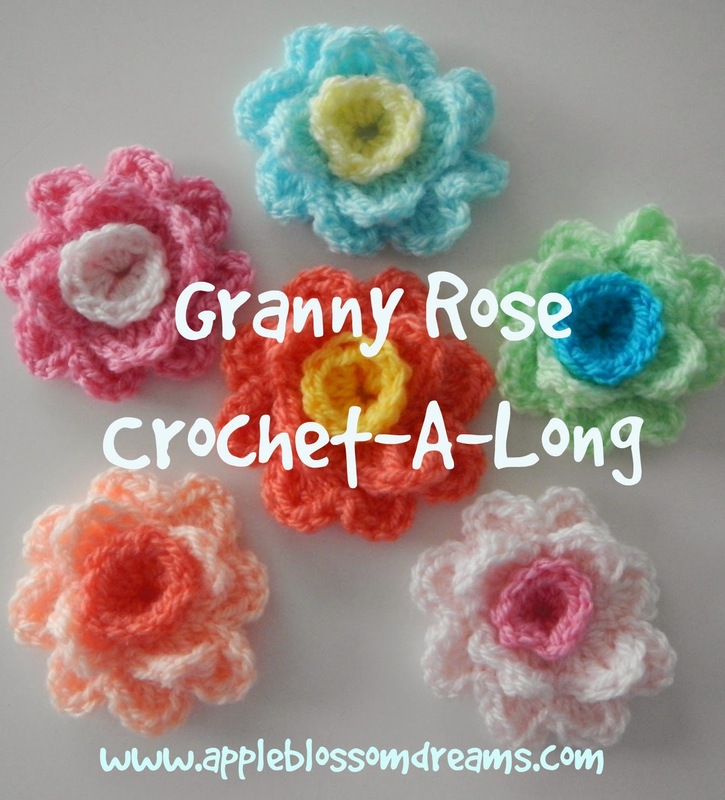 You are all invited to Crochet-A-Long! This crochet-a-long will be in five steps over five weeks. The first week's post will be posted Friday, May 1, 2015. You will need the pattern and it can purchased here. The posts will include photos of each finished step and additional tidbits. The pattern was originally for pillow, but the CAL will be for an afghan. In any size you choose! Mine will likely be a size that would suit a baby girl. 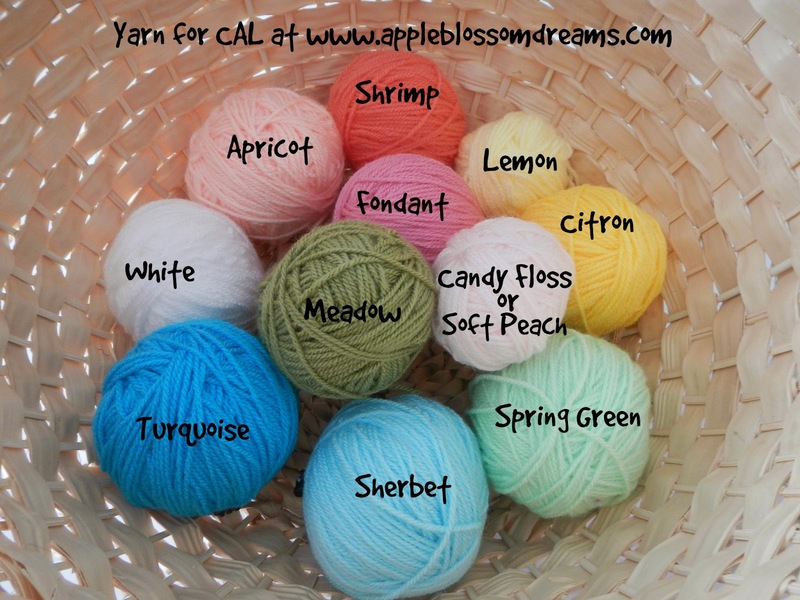 then the photo below indicates the yarn color names. I use Stylecraft Special DK and it is shipped from Deramores in the UK. In Utah, it takes approximately 2 weeks for the package to arrive upon ordering. And today the yarn is on sale for $2.60 for a 100 g skein!!! but this blanket is made with DK (sport weight). Please make your first granny square and adjust the amount of yarn needed for DK. in order to calculate total yarn needed for the specific size of blanket you would like to make. That's just a little tidbit if you like to plan ahead, but, of course, you can use any yarn for this project. This could even be a great stash-buster! (Oh and my favorite part of a CAL is to post the photos of your projects. I hope to connect with you on May 1st! Yay, another crochet-along! I'm eagerly awaiting May 1st...now to figure out what yarn to use. I really like the colors you picked! Thanks Amy! It's been great so far! Hope all is well with you. I'm coming over to visit you now. Glad you are back visiting with all of us, work does get int he way! Love those beautiful flowers. Hello Meredith, Yes work does get in the way, darn it! Oh well, it helps pay for yarn. I'm coming to visit you too! So nice to see you back, Astri now that you are busy with an outside job again. Love your roses in squares! Pretty choice of colours too! Wishing you a Happy Spring! Hello Sandra! Thank you for stopping by and your kind words. I am going to come visit you tonight! You know, with a bit of tweaking those Roses could be Daffodils.... :) What yummy pastels. So nice to hear from you again! I thought I had just been missing posts as I'm rather a stranger to Blogland myself the last several weeks - but now I see you've been busy. Hope the job is going well. Have a great week! Haha, yes I thought of daffodils too...great minds. ;-) I saw some of your work on pinterest and I am coming over! Astri! you came back !! !